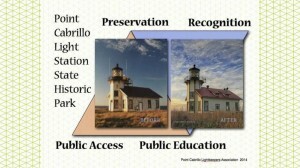 Warren Wade has been involved with Point Cabrillo Lighthouse in many capacities since 1995. He was a member of the committee that revised the original NCIA Master Plan for Point Cabrillo, prior to acquisition by State Parks. As President of the Mendocino Coast Audubon Society he set up and supervised three of the biannual nesting bird surveys of the 300-acre preserve. He has served as a history docent, a marine mammal docent, and a birding docent at Point Cabrillo. Warren holds five academic degrees, culminating in an ScD (Doctor of Science) in Fluid Mechanics from the Massachusetts Institute of Technology. His professional career involved design, development, and qualification of aircraft fuel pumps for TRW Inc. For this work, Warren received the ASME Fluid Machinery Award. After retirement from TRW, Warren incorporated as FluiDesign Inc, designing a number of fluid mechanic devices, including a left ventricular assist pump which has prolonged the lives of 12 patients, to date. Warren has been active in a number of non-profit organizations since moving to Mendocino in 1994 including serving as President of The Caspar South Service Company for 9 years and supervising the water system for the Caspar South Development. He served on the Board of the Mendocino Coast Audubon Society for 15 years, and was President for six years. He has been active in the Mendocino Presbyterian Church, serving as Assistant Treasurer in charge of payroll and accounts payable, as a history docent, and singing in the choir.